Extreme stopping power in a sticky gel that blindfolds an attacker. 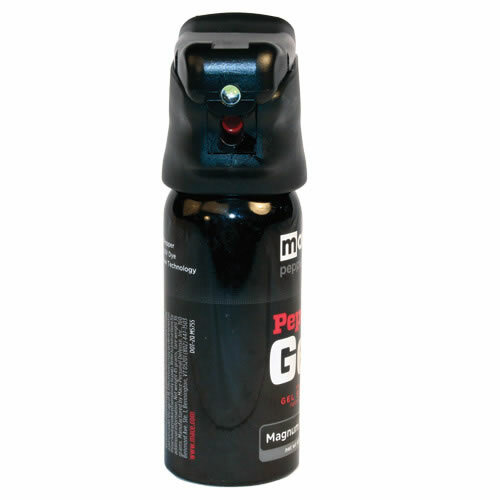 This is a powerful defensive OC spray that will halt an attacker's advance immediately. 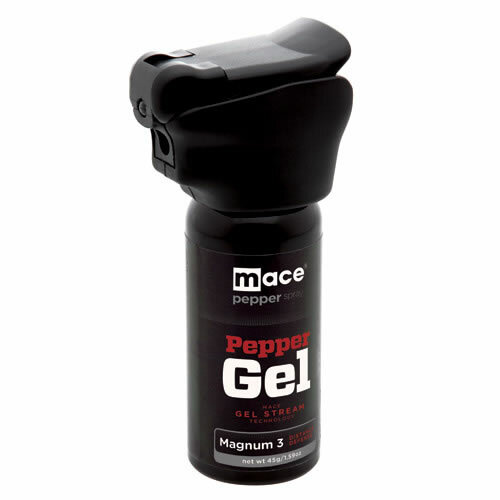 This Ultimate Pepper Gel Formula surpasses regular pepper sprays by delivering extreme stopping power in a sticky gel that blindfolds an attacker. With reduced blowback from wind, the gel stream will go exactly where you aim it. This is a powerful defensive OC spray that will halt an attacker's advance immediately. 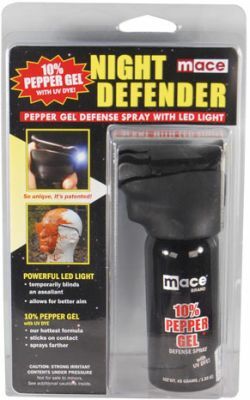 PEPPER GEL NIGHT DEFENDER has a built-in bright LED Light (33 lux at 1m). Having a light allows for better aim while you temporarily blind your attacker. The light will activate when the cap is lifted. As you hold the unit in the ready to fire position with your thumb placed on the actuator, the LED light illuminates the area. Taking a leisurely walk, especially at night, can be somewhat cumbersome and a bit unnerving…so where is the leisure in that? As easy as just wanting to take a nice stroll may sound, for some, it takes some preparation as you can find yourself in unpredictable situations. So, let's think of what one should bring. You might carry a flashlight, a water bottle, and even let your dog tag along. Then, of course, you definitely need something with which to defend yourself. We were only blessed with two hands, having to carry all these things can be a bit awkward. The perfect product to help reduce the number of items one should take along, and offer a sense of security, is the Night Defender. This is a bright LED light and a pepper gel in one. 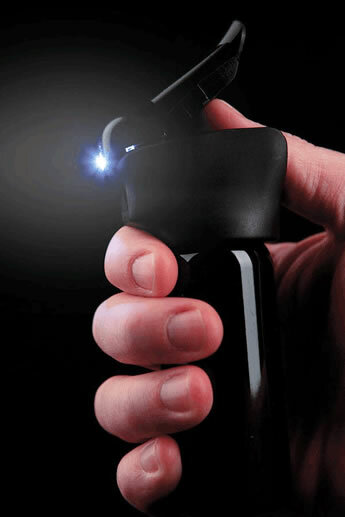 You can spray a potential attacker from up to 18 feet away. The bright LED light can act as an aiming mechanism. Once you have sprayed the attacker, the gel sticks to their face and they cannot wipe it off. This will allow for plenty of time to get away. The Night defender can also be used in your home. For example, someone breaks into your house and they cut the power. 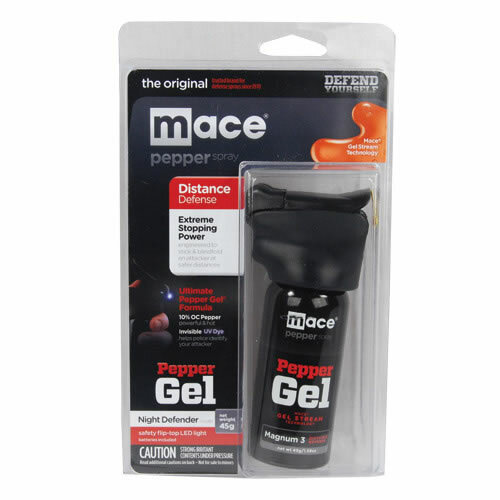 You have the Night Defender's flashlight to see, and the pepper gel to aim and spray at the would-be robber. The light on the front is very good to have. For the price, it is very good, but having a strobe feature for its size would make it even better. Also, for having just 1 led, I wish they made a smaller, keychain version of this, but the price is nice for what you get.